Wine is a science. Wine is Art. Wine is a craft. Wine is a commodity. Wine is a luxury. Wine is a many things to many people. Wine should be drunk. Wine should be discussed. Wine should be savored. Wine should be collected. Yet, any way you look at it, wine is meant to be enjoyed. Luckily, there are many different ways to enjoy wine. Some people like to feel tipsy. Some people like to simply smell the aromas for hours. Some people even like to collect it. Some do so for financial gain (or adrenaline rush or even ego). Some people even collect wine as Art. No, not necessarily for the masterpiece inside, but the label. Since 1945, Château Mouton Rothschild has labeled the grand vin with unique artwork from a famous artist of the time. Kenwood Vineyards has over 30 years of its Artist Series Cabernet Sauvignon. 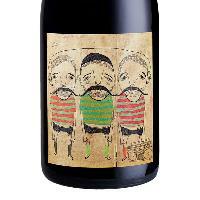 More recently, Manfred Krankl of Sine Qua Non has taken label art to a new level. He adorns all of his wines with his own unique, quirky and often dark artwork. The price of his wines on the secondary market are often a reflection on the condition of the labels. Bottles with nicked and soiled labels can be had for a fraction of the price of pristine bottles. Undeniably, label design is an important part of the wine industry. Many, many people buy wine based only on the visual appeal of the label. How a label appears on the shelf might be the single most important feature of a wine. This is a fact that too many Colorado wineries, and wineries in general, refuse to acknowledge. A few local producers have thankfully confronted these demons. Both Boulder Creek Winery and Canyon Wind Cellars have dramatically updated and improved what's on the outside of the bottle. I am hopeful that now more consumers will be willing to give the quality juice on the inside a chance. When quality wine and appealing labels come together good things can happen. A few weeks ago, I was in Santa Rosa, CA and visited with Kent and Renee Humphries, the brother and sister contingent, of Eric Kent Wine Cellars. Eric Kent has some of the most appealing labels that I have seen. Kent, his artist-wife Colleen and Renee started the winery in 2003 as a way to combine their passion for art and wine. Each wine features a unique piece of artwork. All of the labels and artists' information is a mouse click away at Eric Kent's online gallery. To this day, the have nine vintages with 54 different artists' labels. The "front" labels are crisp, clean and clearly portray information inquiring consumers want to know. Kent says he leaves it up to retailers which label to display on the shelf based on the merchant knowing his or her consumers. Both would actually catch my eye in a wine shop. Renee described to me how she's talked to quite a few customers that have every single bottle of Eric Kent wines on display (empty) in their homes as art. I guess they're enjoying wine twice as much as most people! It just so happens that what's inside is appealing as well. During my visit, I tasted Eric Kent's lineup that is now available in Colorado retailers. All Eric Kent wines are sourced from Sonoma County. They make a variety of single-vineyard and blended pinot noir, chardonnay, syrah and grenache. Kent contracts by the acre from selected growers and helps work the vineyard to get the quality of fruit he desires. Total production of Eric Kent is about 2000-2500 cases. In 2010, they started a second brand, Sarapo Family Wines, produced and blended from wine purchased on the bulk market. The Sarapo lineup offers approachable, more fruit-forward wines at a slightly lower price point than the Eric Kent line. Here are some brief tasting notes from the wines available in CO and an exciting barrel sample. If you want to see the labels, click here.